Brooklyn-based photographer Fiona Gardner and journalist Amy Zimmer have tracked down — through dark subway tunnels, steam-washed alleyways, and maybe even with the old, "I'm your long-lost daughter" bait-and-switch — 50 former Miss Subways for a new Transit Museum exhibit, something the New York Post describes as a "retrospective on the amazing stories behind the pretty faces that once graced the inside of the city's trains." 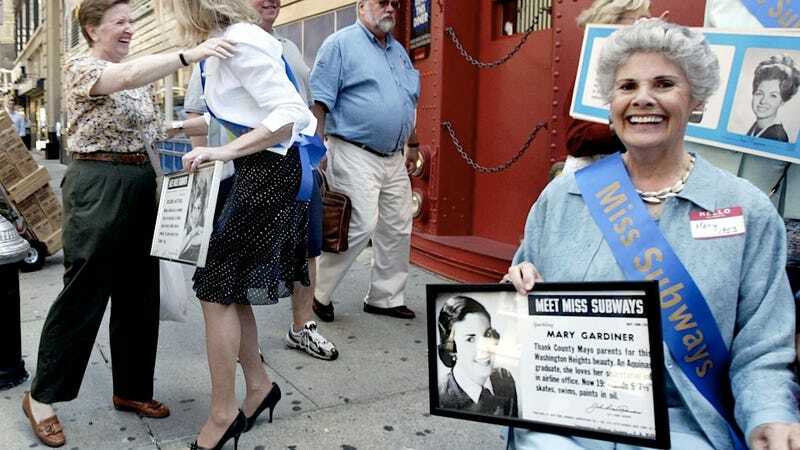 The Miss Subway contest, which was managed by an ad agency between 1941 and 1976, plucked a different woman almost every month out of the grinding, grey obscurity of commuter traffic and pasted her picture on every bus and commuter train in New York. To be eligible women had to ride the subway, otherwise, what would be the point, hmm? Some 200 women held the Miss Subway title, which, for some winners, came with tourism board promotions and meetings with celebrities, because winning a transit contest in New York isn't anything like winning "Most Genial Smile" on the Duluth city bus — you get to meet Fred Astaire. Or Maureen Walsh Roaldson got to in 1968. Being conferred Miss Subway earned women instant recognition in their neighborhoods, and though maybe the Post's phrase "unimaginable honor" may not quite stick with the modern subway rider, it was probably pretty cool to be a celebrity for a week in the time before every commuter became an amateur documentarian. The show opens October 23 at the Brooklyn museum, and features before and after pictures of Miss Subways past, as well as 146 posters from Miss Subway contests.